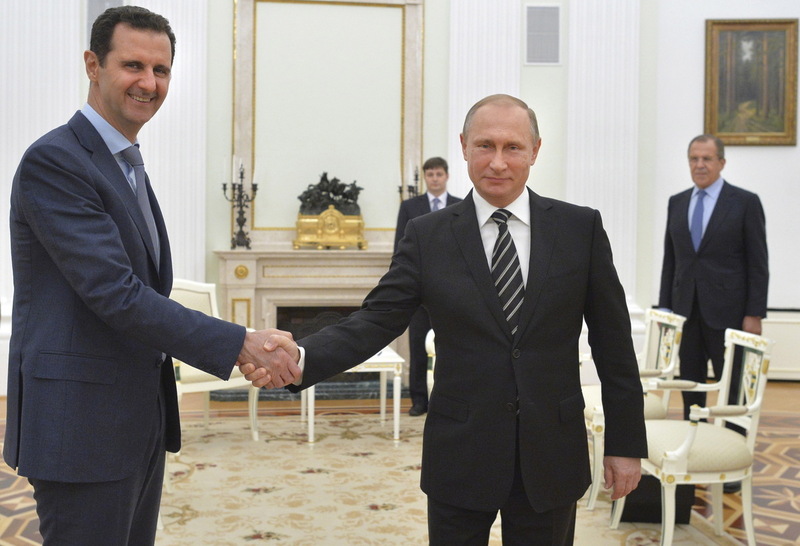 Syria's Assad Visits Moscow To Discuss Military Plans With Putin : The Two-Way The trip was kept secret until after Tuesday's meeting — and after President Bashar Assad had safely returned home. Russian President Vladimir Putin shakes hands with Syrian President Bashar Assad during Tuesday's meeting at the Kremlin in Moscow. The Kremlin's official account of the meeting includes a quote from Assad, saying, "I want to thank the Russian people once more for the help you are giving Syria and express the hope that we will vanquish terrorism." Announcing the visit, state media in Syria and Russia say the two leaders discussed how to fight terrorism, and that the sessions — several meetings and a working dinner — also included foreign and defense officials from both countries. "Putin promised he'd work with world powers to find a political solution to the conflict, now in its fifth year. Assad said that terrorism is the main obstacle to peace, and that Russia's air campaign — now in its fourth week — has halted the spread of terror. "Washington and its regional allies say Assad is part of the problem. But in recent weeks, some of Assad's staunchest critics, including Turkey, say he could be part of a political transition." The Moscow trip was also intended to show Assad is safer after Russian warplanes and ships began carrying out airstrikes in Syria, NPR's Corey Flintoff reports from Moscow. Putin and Assad met on the same day the U.S. and Russia agreed on a system to avoid potential clashes and accidents between their aircraft in Syria. "The Russian Embassy in Damascus denies that any Russians were killed, either Russian servicemen or volunteer fighters. As you know, it's recently become illegal in Russia to report on casualties of Russian servicemen. So I think it's unlikely that we'll get any clear acknowledgement from Russia's defense ministry that any Russians have been killed or wounded." And as for the news that leaders in Iraq's government are prodding their prime minister to ask Russia to carry out airstrikes on ISIS militants, Corey says, "Russia would like nothing better than an invitation from Iraq." He adds, "It would be a big embarrassment for the United States if Iraq asked Russia to step in. The way the Russian air campaign [in Syria] is being presented here in Russia is that President Putin basically had to step in because the Americans have been so ineffective there."